9/10 from Vive Le Rock! Rock magazine Vive le Rock reviewed Never To Be Tamed and gave it 9/10. Read the full review by clicking below. After being the featured artist a few weeks ago, Mancunia Promotions have reviewed Never To Be Tamed and really liked it (of course!). Just one of the songs boasts such review as "...kicks off sounding like a top 90′s ‘Charlatans’ track quickly picking up pace to get your head banging to some amazing riffs and delivery to resemble the best of ‘Primal Scream’ " - Anton Pell. Were you at Slydigs' album launch party at the Barfly in Camden on Saturday night? We'd like to know what you thought of the gig. The whole room was rocking all the way through the set and still bouncing afterwards as free EPs were being handed out to everyone. 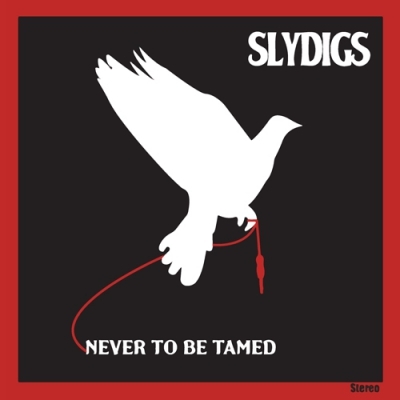 Lisa Fox of Bring The Noise writes :"Although this genre is heavily saturated with this common image, there’s something refreshing in Slydigs’ sound. They combine catchy guitar riffs, echoing drums and haunting guitar licks to great effect. Lead singer Dean Fairhurst’s grainy and gritty vocals are both quirky and interesting...Simply put, the songs on Never To Be Tamed are punchy and to the point. They are just fun, guitar based rock songs...9/10"
"...this is a strong debut, and a fair opening salvo on England’s confused rock scene...Ones to watch" - MisterCharlie, Supajam. Never To Be Tamed hits the shelves today! We'd love to see your pics of you with the album, send them to us on Facebook/Twitter/email or anything else! At around 1.30pm in the centre of Manchester, right outside HMV, the band pulled up in a van and gave the crowd a blinding 3 song set before packing up and leaving as quickly as they arrived. The first official single has been released today, ahead of the album launch in a week's time. The Love That Keeps On Giving is available for download from all good retailers.